Description: Attractive early county map of Essex engraved by William Kip for William Camden's "Brittania", a history of Great Britain and one of the most important early books published in Britain. Coloured. Description: County map. Map copiously decorated with armorial shields, putti and allegorical figures. Coloured. Description: County map with panel of coats of arms. Decorative cartouche. All in fine original colour. Description: Essex. Early county map with decorative cartouche. Coloured. Description: Chelmsford to Saffron Walden. Early coloured road map in Ogilby's distinctive "ribbon" style. Description: County map. Geographically based on Saxton. Also shows road network. Coloured. Description: Essex. Decorative county map, with description and distances. Coloured. Description: County map with borders illustrating local coins and Deneholes. Original colour. Description: County map from Bowen's "Large English Atlas. Outline colour. Decorative cartouche. Description: County map. Detailed map with numerous contemporary annotations. Original colour. 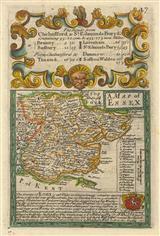 Description: County map of Essex with Zatta's typical illustrated cartouche. Original outline colour. Description: Chart of the Essex coast centring on Harwich and dedicated to Samuel Pepys. Description: Essex. Miniature county map. Coloured.